And so it begins. Winter. Snow. The works. Business just isn’t as usual around here these days. Its cold and my laziness begins to sink in. Some days, taking the extra 20 minutes to get the kids bundled up and out the door just doesn’t sound so appealing so home we stay. And on those kinds of days, this stew tends to happen. Its been a very long time favorite of mine. Super deep, rich flavors and textures galore. Warmth in a bowl. 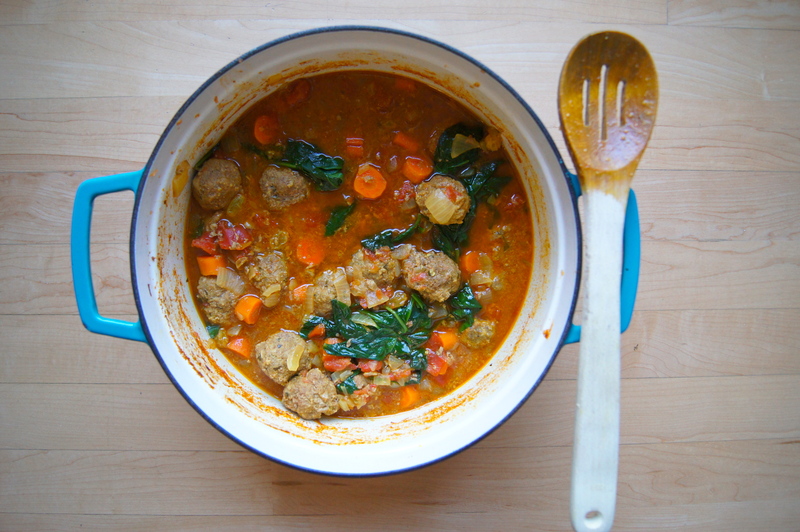 I typically make the meatballs in the morning while the kids are playing and keep them in the fridge until I throw the rest together late afternoon; it makes putting the stew together so simple. And as it simmers the amazing smells soak into every inch of our home…and I always welcome them to stay as long as they would like. It’s even better leftover, too, but the chances of having leftovers are just not likely. Serve it on top of brown rice or mashed cauliflower….it’s so incredibly yummy. Mix all ingredients together gently with your hands. Shape into tablespoon sized meatballs. If making ahead, chill in the fridge for up to 5 hours. Preheat oven to 350. Heat olive oil in a dutch oven or oven-safe pot. Add the onions and cook until beginning to soften, about 10 minutes. Add the garlic, cinnamon and turmeric and sauté for 30 seconds. Stir in beef broth, tomatoes (with juice) and raisins. Bring to a simmer. Stir in carrots and lay the meatballs in the stew in an even layer. 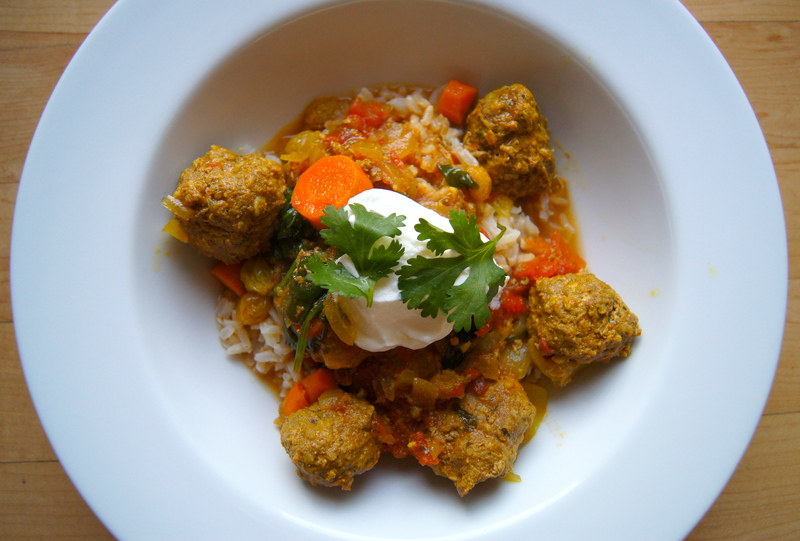 Sprinkle with cilantro, cover and bake in the oven until meatballs are cooked through and carrots begin to soften, about 30 minutes. Add the spinach to the top of the stew, cover and cook for an additional 5 minutes. Remove from the oven and gently stir in the spinach. Serve over rice or mashed cauliflower with a dollop of greek yogurt on top. Serves 6.